The latter condition states that the numerical response should be an increasing function of prey abundance. This condition will be satisfied for any reasonable numerical response and let us focus on the first condition. This stability condition can be interpreted graphically. The equilibrium is locally asymptotically stable provided the slope of the tangent line to the graph of the functional response at the point (R*, f (R*)) is higher than is the slope of the line that passes through the origin and the point (R*, f (R*)). For example, in Figure 2c this happens if the prey equilibrium density is to the left of the critical value Rcrit at which both slopes are the same (i.e., the tangent to the graph, shown as the dashed line, passes through the origin). Alternatively, stability condition  states that for a prey-predator equilibrium to be locally asymptotically stable it is sufficient that the ratio of consumed prey to total prey (i.e., f (R)/R, Figure 2, right panel) is an increasing function of prey density at the equilibrium. Indeed, condition  is nothing else than expression of the fact that derivative of function f (R)/R with respect to prey density is positive. This is equivalent to saying that the prey zero isocline (C = rR/f(R), shown as the horizontal dashed curve in Figures 1b and 4-8) has a negative slope at the equilibrium. Clearly, a linear functional response used in the Lotka-Volterra model, the type I functional response and the type II functional response do not satisfy stability condition  (Figures 2 a, 2b, right panel). This means that the interior equilibrium is not asymptotically stable and we can ask what happens if populations are shifted of the equilibrium. 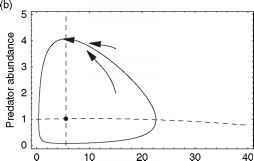 In the case of the Lotka-Volterra model with the linear functional response we already know that after a perturbation trajectories oscillate around the equilibrium (Figure 1 ). Figure 4 Prey-predator population dynamics  with the Holling type II functional response. Panel (a) assumes small handling time (h = 0.02) while panel (b) assumes large handling time (h = 0.15). The dashed lines are isoclines. Parameters: r = 1, A = 1, e = 0.2, m = 1.
regulation. This happens, for example, when predators are inefficient when handling prey (i.e., when the handling time is large), or the intrinsic per capita prey growth rate is high. This analysis validates the statement that the Holling type II functional response is destabilizing, which means that when handling times are positive, the neutrally stable equilibrium of the Lotka-Volterra model becomes unstable. The Holling type I functional response combines the effects of the linear functional response with the Holling type II functional response for large handling times. Thus, when the prey-predator equilibrium is in the part of the prey-predator phase space where the functional response increases linearly (Figure 5), small perturbations lead to periodic oscillations around the equilibrium while large perturbations lead to trajectories that diverge from the equilibrium. The work of A. N. Kolmogorov shows that prey-predator coexistence can occur only either at the equilibrium, or along a limit cycle. However, in the case of the prey-predator model  with the Holling type II functional response it can be proved that no limit cycle exists. Indeed, because q (A.
the Dulac criterion excludes prey-predator limit cycles. Figure 5 Prey-predator population dynamics  with the Holling type I functional response. Small perturbations from the equilibrium lead to cycles exactly as in the case of the Lotka-Volterra equation with the linear functional response. 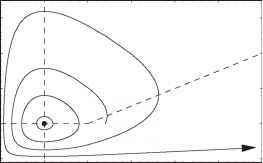 Larger perturbations lead to trajectories that diverge from the equilibrium. The dashed lines are isoclines. Parameters: r= 1, A = 1, e = 0.2, m = 1, const = 10 where const is the upper ceiling of the Holling type I functional response. left of Rcrit in Figure 2c). This is the case shown in Figure 6a. At a higher prey equilibrium density, the functional response saturates and predators cannot regulate their prey (Figure 6b). At the population equilibrium the first stability condition  simplifies to 8g(R*,C*)/8C<0 which means that the predator growth must be negatively density dependent. The second stability condition  simplifies to 8g(R*,C*)/8R > 0, which holds provided the numerical response increases with increasing prey density. This analysis implies that density-dependent predator growth stabilizes prey-predator population dynamics when handling times are neglected (Figure 7). Depending on the parameters, positive handling times can surpass the stabilizing effect of predator interference leading to an unstable equilibrium. Now let us consider the case where the per capita prey growth rate is density dependent and decreases with increasing prey density (dr(R)/dR < 0). The simplest prototype of such dependence is a linear decrease in the per capita prey growth rate (r(R) = r(1 — (R/K)), which is then the logistic equation with the carrying capacity K. This type of prey growth is also called the bottom-up regulation. Clearly, the negative density-dependent prey growth promotes prey-predator coexistence because the prey growth is now controlled by two independent mechanisms: top-down and bottom-up regulation. This is reflected in stability condition  where the left hand side of the inequality is smaller for the negative density-dependent prey growth rate when compared with exponentially growing prey. Figure 6 Prey-predator population dynamics  with the Holling type III functional response. (a) shows the stabilizing case where the prey population equilibrium is in the range of prey abundances where the Holling type III functional response is stabilizing (i.e., smaller than Rcritfrom Figure 2c). (b) Shows the case where the prey population equilibrium does not satisfy this condition and the equilibrium is unstable. 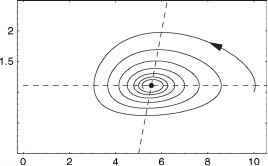 Dashed lines are isoclines. Parameters: r = 1, A = 1, e = 0.2, h = 0.02, m = 1 in (a) and m = 5.5 in (b). Stability condition  holds for all parameter values. 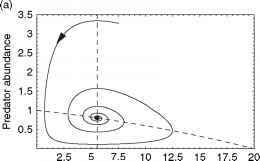 Using the Dulac criterion it can be proved that no limit cycles exist and the equilibrium is globally asymptotically stable (Figure 8a). At the critical carrying capacity Kcrit the equilibrium undergoes the Hopf bifurcation and for higher carrying capacities a unique globally stable limit cycle exists (Figure 8b). This model shows that prey-predator coexistence is not limited to an equilibrium. In fact, as the environmental carrying capacity (K) increases, the stable interior equilibrium is destabilized and a globally stable limit cycle appears. This phenomenon was termed the paradox of enrichment because, contrary to the intuition, enriched environments (i.e., environments with a higher K) do not promote species coexistence at an equilibrium. This paradox is easy to understand, because an increase in the environmental carrying capacity means a weaker bottom-up regulation, thus a less-stable prey-predator population dynamics due to the destabilizing Holling type II functional response. Figure 8 Prey-predator dynamics for the MacArthur-Rosenzweig model . (a) Shows the case where the carrying capacity is below the critical level Kcrit (K=20) and the equilibrium is globally asymptotically stable. (b) Shows that for higher carrying capacities (K = 70) there exists a globally stable limit cycle along which prey coexist with predators. Dashed lines are isoclines. Parameters: r = 1, A = 1, e = 0.2, h = 0.02, m = 1.